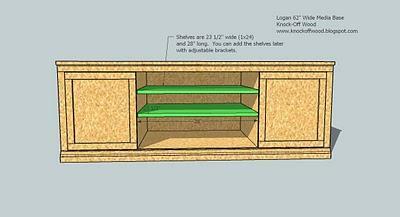 Door Cut List – Recommend measuring the opening in the drawer and building the drawer 1/4″ smaller thean the overall opening. Remember that the door will cover the middle partitions, as shown in the diagrams. These dimensions give are the ideal door dimensions. 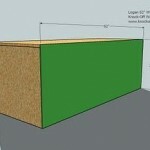 A 1×24 is simply 3/4″ plywood ripped into 23 1/2″ wide strips, 8 feet long. 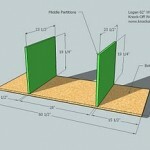 You can get two 1x24s out of each sheet of plywood. 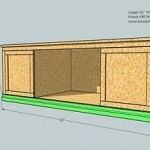 This system is used to ease building, creating straighter cuts, and conserve wood. If you cannot find 3/8″ plywood, you can use 1/2″ plywood for the backs and 1/4″ stock (for example maple 1/4″ thick x 1 1/2″ wide). Hobby stock is available at our local store in a wide variety. 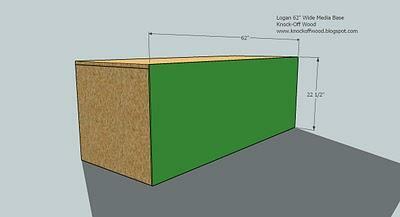 Cut your 3/4″ Plywood or MDF into strips 23 1/2″ wide by 8′ long. These strips become 1×24 boards. 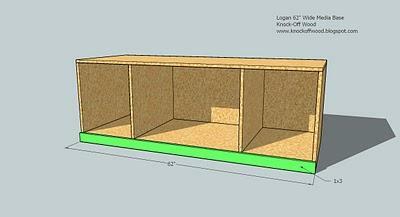 From 2 of the 1×24 boards, cut the the top and a shelf, and the bottom and a shelf. 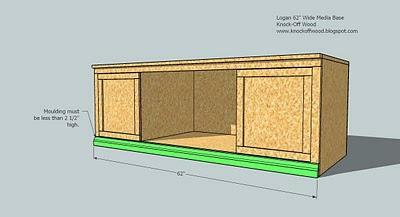 Then cut the remaining sides and middle partitions out of a third 1×24. 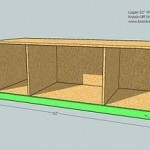 You will have one 1×24 leftover for future projects. Work on a clean level surface. You can fasten with nails or screws, depending on your tools and the use of this piece. Screws will hold better, nails are easier. My general rule is screw anything that will be “used” like chairs and benches, and nail sedentary pieces like bookcases and hutches. I will leave this up to you. If you are screwing, make sure you predrill and countersink your screws. If you are using MDF, avoid fastening within 1″ of the edge of the MDF. Do not use wood screws on MDF. 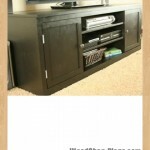 Wood screws do not have a straight shaft and will split your MDF. I have had luck with drywall screws (after all, drywall is very similar to MDF). Make sure you predrill the entire distance of the screws. It’s going to screeech, so wear hearing protection. And glue. 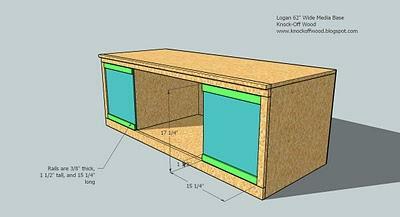 My favorite option is to screw the “box” together, and then use finish nails to add the frame. 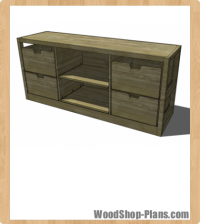 That way the frame does not have blemishes, but the piece is built sturdy. Make sure you take a square of the project after each step. 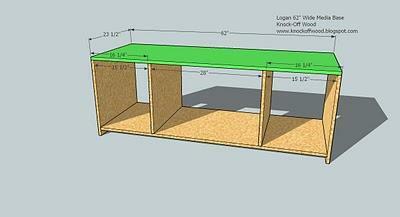 Measure and mark out any joints before fastening. Be safe, have fun. Bottom and Middle Partitions. Fasten with 2″ fasteners the bottom, A, to the middle pieces, B (green) as shown above. Sides. 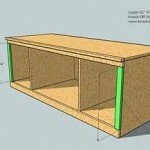 Use the 2″ fasteners to fasten the sides to the bottom as shown above. 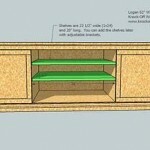 There will be a 1 3/4″ clearnance under the bottom shelf. Top. Fasten the top to the sides and middle partitions, as shown above. 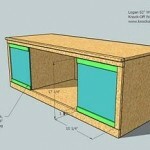 Use the 2″ fasteners. Make sure you fasten the middle partitions to the measurements shown above. Back. 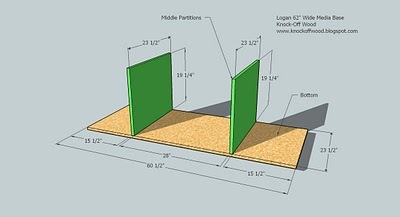 Fasten the back with 1 1/4″ fasteners to the top, bottom, sides and middle partition, as shown in the above diagram. Bottom Trim. Fasten the bottom trim to the bottom and sides as shown above. 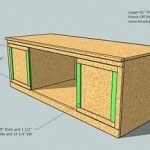 Use the 2″ fasteners. Top Trim. Fasten the top trim in place, as shown above. Be sure to fasten to the middle partitions and the sides. You will not be able to fasten to the top. See next step. Top Edge Trim. 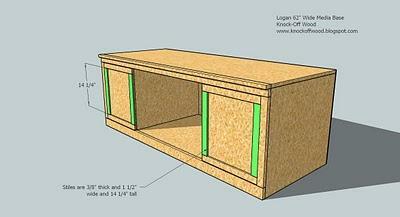 Fasten the top edge trim in place, as shown below. Make sure you fasten through the face of the trim into the top of the project. Side Trim. Fasten the side trim to the base unit, as shown above. Keep outside edges flush. Doors. Test your backs to make sure they fit in the openings. Notice how the doors cover the middle partition. Use 5/8″ fasteners, lots of glue and clamps to fasten the rails to the back of the doors, as shown above. Door Stiles. Fasten the stiles, as directed in step 9, to the doors. Lay flat to dry, preferably with something heavy on top. 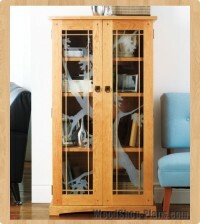 If you are staining the project, you will need to add edge banding to the top and inside edges of the doors. 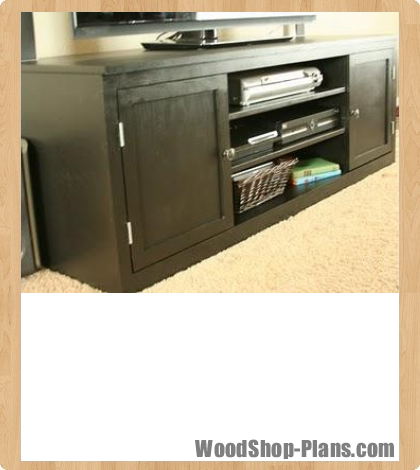 This is easy and inexpensive to do (see HOW-TO section for a post on Choosing your Wood). After you have finished the project, attach the doors to the cabinet using either butterfly hinges or euro hinges for face framed cabinets. Optional Base Moulding. 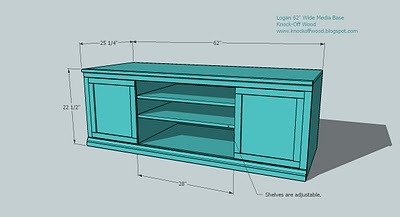 If you would like to dress the base up, add moulding as shown above. 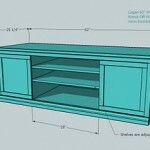 The moulding will need to be less than 2 1/2″ in overall width. Shelves. 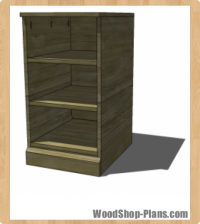 Determine where you will place your shelves. 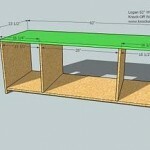 Drill holes 1″ from the front and 1″ from the back on both middle partitions, 1/2″ deep, with a 1/4″ drill bit, where the base of the shelf will sit. Insert shelf pins and place your shelf in the base unit. 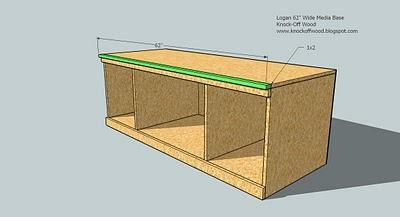 If you are staining your base unit, you will need to add edge banding to the front edge of the shelves.